The international debt system needs a major overhaul. 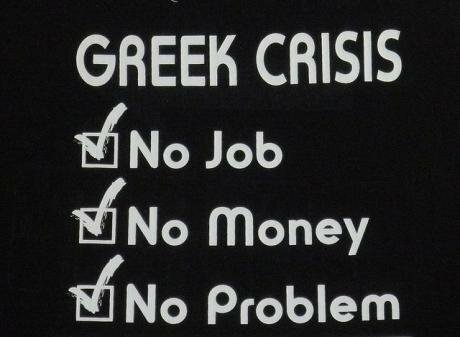 The Greek people have not been bailed out. Flickr/Duncan Hill. Some rights reserved. When the IMF, European and ECB bailouts began in 2010, €310 billion had been lent to the Greek government by reckless banks and the wider European financial sector. Since then, the “Troika” of the IMF, EU and European Central Bank have lent €252 billion to the Greek government. Of this, €34.5 billion of the bailout money was used to pay for various “sweeteners” to get the private sector to accept the 2012 debt restructuring. €48.2 billion was used to bailout Greek banks following the restructuring, which did not discriminate between Greek and foreign private lenders. €149.2 billion has been spent on paying the original debts and interest from reckless lenders. This means less than 10% of the money has reached the people of Greece. Today the Greek government debt is still €317 billion. However, now €247.8 billion – 78% of the debt – is owed to the “Troika” of the IMF, European Union and European Central Bank, ie, public institutions primarily in the EU but also across the world. The bailouts have been for the European financial sector, whilst passing the debt from being owed to the private sector, to the public sector. When the “Troika” programme began in 2010, the Jubilee Debt Campaign warned that this was repeating mistakes made in developing countries in the 1980s and 1990s. Bailing out European banks rather than making them cancel debts would ensure the private speculators would get repaid, whilst the public would pay the costs of having to cancel debts in the future. Austerity would crash the economy, increase poverty and unemployment, and increase the relative size of the debt. This is exactly what has happened. “may be seen not as a rescue of Greece, which will have to undergo a wrenching adjustment, but as a bailout of Greece’s private debt holders, mainly European financial institutions”. Iran said it would have expected a debt restructure to be discussed, as did Egypt, which said the IMF’s growth projections were “optimistic”, a word repeated by China. The growth projections were extremely optimistic; Greece’s economy is now 19% smaller than the IMF said it would be, having shrunk by more than 20% since the start of 2010. India warned that the scale of cuts would start a spiral of falling unemployment which would reduce government revenue, causing the debt to increase, and making a future debt restructuring inevitable. They did; unemployment in Greece is over 25%, with almost two-in-three young people out of work. The combination of the crashing of the economy and the Troika debts means Greek government debt has grown from 133% of GDP in 2010 to 174% today. The bailout and austerity programme did not take place because it was thought to help the Greek people or reduce the size of the debt. It was done to save European and Greek banks and protect the profit of speculators. Syriza is proposing a debt conference based on the “London conference” which agreed debt cancellation for Germany in 1953. The 1953 conference agreed to cancel 50% of Germany’s debt to governments, people and institutions outside the country, and the payments on the remainder were made conditional on Germany earning the revenue from the rest of the world to pay the debt.Greece was one of the countries which took part in the debt cancellation. Syriza is proposing debt cancellation through a similar conference (some have suggested of around 50%, though there is no policy officially stated), with the remainder of the debt to be paid over several decades to ensure that Greece can continue to repay. The German debt deal in 1953 was very successful. It supported German economic recovery, and gave an incentive for creditors to trade so that they would be repaid. In 2012, two years after the bailouts began, it was finally accepted that Greece needed some debts cancelling. An agreement was reached with many private creditors to cancel 50% of the debt owed to them. However, by this stage, the IMF, EU and ECB had been bailing out these reckless lenders for the previous two years, so many had already been repaid. None of the debts owed to the public institutions were included in the debt reduction. Moreover, whilst the IMF, EU and ECB debts were excluded, debts owed to Greek banks and financial institutions, including pension funds, were not. The 50% debt reduction bankrupted these banks, so the Greek government borrowed more money from the IMF, EU and ECB to bailout the banks. The pension funds which lost large amounts were not refunded. Finally, whilst a large majority of private creditors agreed to the debt reduction, various vulture funds refused to do so. These speculators bought up Greek debts owed under British law cheaply and have continued to demand payment in full. The total amount of “vulture fund” debt which avoided the agreed restructuring was €6.5 billion. The Greek parliament passed legislation to enforce the agreed debt reduction on all bonds held under Greek law, but the British government refused to do the same. The vulture funds have continued to be paid, making a huge profit on the amount they bought the debt for. This was effectively profit being given to the vultures by the IMF, EU and ECB, which has left a debt for the Greek people. At the end of 2011, before the “debt relief”, Greece’s government debt was 162% of GDP. Today it is 174%. Syriza’s policy is to hold a conference to negotiate debt reduction, rather than a default on the debt. However, if a default did take place, there is no economic reason why this would mean Greece leaving the Euro. Forcing Greece out of the Euro would be a political retaliation to a default. Even if Greece were forced out of the Euro it could continue to use the currency, just as many countries use the US dollar without the approval of the US government. What other Eurozone members could do is withdraw European Central Bank lending to Greek banks, so that all Euros in circulation in Greece would have to already be there, or come from income from trade. Whilst Syriza has said it will not unilaterally default on the debt, defaults tend to be economically beneficial for the country concerned. At the end of 2001 Argentina defaulted on unaffordable debt payments. In 2000, Argentina’s debt payments had reached 45 per cent of exports ($14 billion), double the amount the IMF and World Bank regard as payable. At the time the Argentine people had experienced three years of recession. 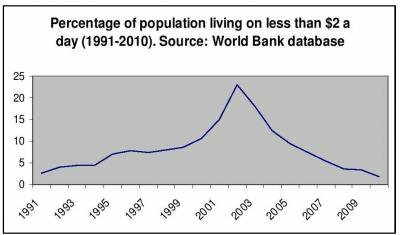 The percentage of the population living on less than $2 a day had quadrupled from less than 5 per cent in the early 1990s to over 20 per cent. 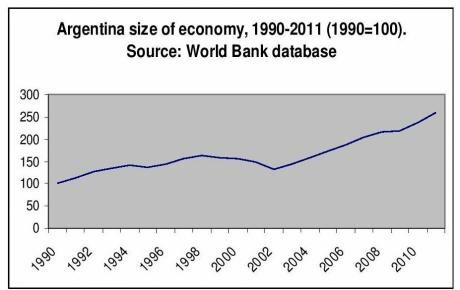 Following the default, the Argentine economy began growing again, poverty fell rapidly and the country became more equal. The Greek and European debt crisis is the latest in a long-line of debt crises which have affected all continents since bank lending was liberalised in the 1970s. The African and Latin American debt crises of the 1980s and 1990s were followed by the East Asian Financial Crisis of 1996-1998, Russian default in 1998 and Argentina default in 2001. The current case in the US courts, where vulture funds have forced Argentina to default on its debts, has convinced developing countries that change is needed and rules need to be introduced through the UN for resolving debt crises. In September 2014 a UN resolution was passed by 124 votes for to 11 against to establish a new legal framework for the debt restructuring process (such as a bankruptcy procedure for governments). The first negotiations in this process are taking place in early-February 2015. However, despite the clear failures to resolve debt crisis in Europe, the EU decided to abstain on the vote, with the UK and Germany amongst those who broke from this collective position and voted against. Such governments are acting as if the international debt system is working fine, when current events in Greece and Argentina show it is clearly broken and in need of major overhaul. Thanks to the Jubilee Debt Campaign for permission to republish this.